Mark your calendars and pre-register today! SingYourJoy starts again on MONDAY, September 10th. SingYourJoy, Victoria's young adult chorus, is a NON-AUDITIONED group of people (ages 16 - 29 ) who love to sing. There are no fees to participate - just your commitment to spend your Monday evenings learning, laughing and SINGING! If you've never experienced SingYourJoy - this is your chance to be part of a great community! We welcome new and returning singers on TWO evenings - September 10 & 17! 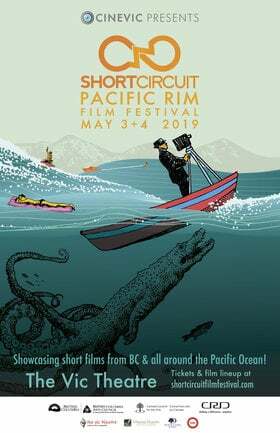 In person, registration starts at 6pm on these nights. Our 13 week season ends in concert on Friday, December 7th. 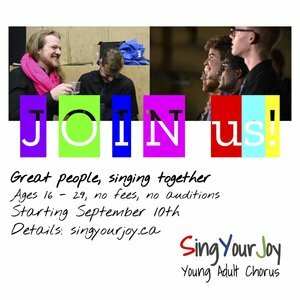 SingYourJoy Young Adult Chorus - a non-auditioned chorus for young adults (16-29) from all walks of life, joining our voices together in an exuberant expression of joy, building friendships, and growing community. Co-directed by Christine Chepyha & Gordon Miller.